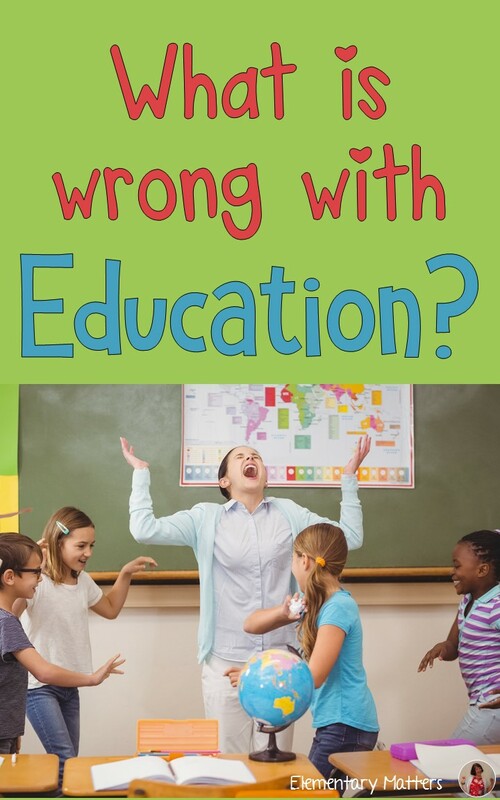 Elementary Matters: What is Wrong with Education? Yes, that's the question. I don't actually have the answer or any solutions, but I'm just putting this question out there. Summer is a good time to reflect. I tend to be a very reflective person, and have always wanted to do the very best I can do for the children. I know there are some problems in education (as in all walks of life) but the first step in solving a problem is to identify a problem. As a veteran teacher, I've seen lots of changes in education. Some are great, others, not so much. I'll be sharing all ideas in a different post anonymously. Then we can discuss possible solutions. I doubt there's a teacher out there who believes we need to test as much as we do. I'd much rather spend that time with my students involved in true learning experiences! This lack of respect can come from administration, parents, and the students themselves. You know the parents... they love their children so much, they'll do anything they can to make the child's life perfect. For example, rather than watching their child struggle to tie their shoes, they tie the child's shoes whenever necessary. What we end up with is dependent children who can't function without their parents being their for their every whim. These are the children who expect a toy or a prize for every little effort. They're not expected to do chores or lift a finger to help others. Getting them to do any classwork involves a carnival act or an act of congress. So there are 5 things to start you off! Luckily, there are still a whole lot of wonderful teachers, administrators, parents, and students out there that make it worth it, but I really want your ideas on what's hurting us. Again, you can share your ideas here, or (if you wish to remain anonymous) email me at elementarymatters@gmail.com with the subject line: What's wrong with education? I wouldn't necessarily call this a "problem," but parents are working so hard ~ just to pay the bills, and they just don't have the time/energy to read to and/or help their children. A lot of kids are so needy, and school is their only safe and happy place. So true! Even though parents are doing everything they can, teachers need to make up that gap. Children are "needy" because e their parents aren't spending enough time with them. Parents need to spend quality time with their children and parent them, not friend them. Yes, it takes time and energy but the end results are worthwhile. I totally agree! Parenting is so tough, and they get no training! Kids need a whole lot of love. It's absolutely amazing : I'm a teacher in France and we do have the same questions ! How can we "transform" a child into a student ? That is to say, how can he learn for himself and not because he has to ? I try to do my best to offer my students several kinds of handlings. They don't work on the same point of concept at the same time. That's a lot of work for a teacher and it requires to be organized ! I really enjoy to read you ; thank you for sharing your work and ideas. I hope you'll forgive my very bad english. Your English is just fine! It's so hard to meet the needs of all the children, especially when they are all so different and have different needs. Thanks for your input! I have some experience with these segregation more information like this policies of education. Some of it is good and some of it is not so good.